Great news, comrades! Our court system is doing its due diligence in assuring that every Democrat voter is a SuperVoter™. By striking down voter ID requirements in four states, hopefully setting a trend, Democrat SuperVoters™ can vote early and often. How do the courts do it? Simple. By invoking the Race Card™, unbiased fair-minded judges are able to satisfy themselves that demanding a voter identify himself (or herself, itself, etc.) is racist. In fact, one justice said that North Carolina’s law clearly showed “racially-discriminatory intent” and that the law would “target African-Americans with almost surgical precision”. And who can argue against that? It’s true that you can apply for free voter identification cards in Wisconsin, North Dakota, North Carolina, and Texas, but that’s not the point. Asking someone who isn’t white to identify themselves is so patently racist, it takes one’s breath away to think that voter ID laws and other Jim Crow legislation still exist in this country. Being progressive, we’re not saying that minorities are less intelligent or less capable of getting voter IDs than white people. Oh, who do I think I’m fooling? Of course we are. Let’s just put that on the table for all to see. We’re progressives. We have demanded lower standards for minorities for so long because we honestly see them as inferior. You know it, and I know it. We think these laws are racist simply because we assume the inability of a person of minority status to figure out how to get a voter ID without handholding from a compassionate white progressive. There, just admit it and feel better about yourself. After all, assuming minorities are inferior isn’t racism, it’s compassion. But back to the subject at hand. Let’s hope that what was begun in these four states is only the beginning. If more such laws are struck down over the next month or two, it will be too late to challenge them successfully in higher courts and get the decisions overturned before the election. The newly empowered SuperVoters™ may be able to tip the election in some districts. Finally, we will see the end of White Privilege™ in this country, and we’ll elect an old white woman in a white pantsuit instead of Trump who is just too dark to be our next president. So, I'm trying to be funny to make a point, right? I mean, SuperVoter™, how clever, right? And then I look up the term online and discover it's already in use by the Democrat Party. It has to do with planetary alignment or something. So that's what happened. I thought the headaches and weird political dreams were just side-effects of the Jiffy-Lobo. Given the embarrassment and subsequent non-personhood of the former DNC Chairman, is this super voter status contingent on a positive result on a Wasserman test? SuperVoters are known to be extremely camera-shy and avoid public attention by pretending to be regular voters (a technique known to evolutionary biologists as mimicry). But a rare sighting of a SuperVoter can be seen in this ThinkProgress article. Do they give out free capes to the super voters? I heard through the beet fields about it. Yes, and free cigarettes for more equal voting efforts. Wonderful! This is better than the capitalist Edna Mode proposal. Thanks for the graphic. It should be included in every textbook on government. oh, yep - and I heard sumptin about Obamaphones, from a lady. Dear Leader had enough foresight to appoint all three judges involved in this decision. Voting day will be very chaotic with all the voters getting to all the places they have registered. On your power point under 2. General Election, the Democrat's column, shouldn't they have a percentage devoted to Super Dead Voters? Don't they get any credit? Rising from the dead to go vote isn't easy you know. ... Voting day will be very chaotic with all the voters getting to all the places they have registered. What, you worry? Unconfuse yourself, Comrade - busses! BUSSES!!! Didn't Israel-election-2015 prove the agility of troops commanded by glorious Comm-Org-One? We anticipated that by determining that death was a disability, and therefore denying the franchise to the deceased was discriminatory. We even have a necro-proxy training video. But since we have necro-proxies to ensure the deceased are not bypassed in the voting process, I do like your idea of SuperNecroProxies™. What if the deceased missed an election or two since passing away? We need SuperNecroProxies™ to even the ledger and promote voter equality. Comrade Dude, thanks for posting that wonderful informative training film! I had not seen that and so much was explained. The glorious Kollective has certainly got things under control! Hail the Many Titted Imperial Empress, Long Live The Cube! isn’t it, uh... respiratorily challenged ? alternatively cardioactive ? metabolically nonpresent ? sunlight disadvantaged ? ashwise involved ? On the strength strenght of Comrade Ivan's inferred denouncements, the equal spirit of FDR and I eagerly anticipate the Show Trials which also must be looming. Our thought is that the purge may climb high the proverbial ladder. I believe I recall reading previously that Comrade Square is unqualified to vote in this upcoming election due to his current non-citizen status. Couldn't he resolve this simply by illegally crossing into Mexico on November 1st, and then voting at one of the many newly opened voting booths... er, I mean, border crossings as he returns on election day? Just a (hopefully) equal suggestion. Was I in gulag the day this immigration event was announced in the security briefing? Glorious news comrade Red Square! Comrade Genosse and myself will gladly guide you on a tour through the Korrektified Western European cities (beer included!!!) ! Isn't that right, comrade genosse? Comrade Genosse and myself will gladly guide you on a tour through the Korrektified Western European cities (beer included!!!) ! Isn't that right, comrade genosse?Aber ja ! da kanyechno ! sure as Marx ! Наши поздравления! * We need more informed citizens who love this country and the good things it stands for. *I hope I'm idiomatically correct. Comrade Direktor, I must ask, is this a personal or diplomatic trip? If it is diplomatic, what sorts of business will you be engaging in? Also, now that you have gained citizenship in the American Empire, will you be voting purely in Communist interests, or will you decide on a Communist-Green Party split? Furthermore, if you ever decide to run for office, I will issue my own death certificate and vote 100 times or more for you. Another sighting of SuperVoters at a Hillary rally, captured by Mr. Pinko's candid camera. I never believe anything until the government denies it. So, what are your takes on the Roswell crash site? So, what are your takes on the Roswell crash site? 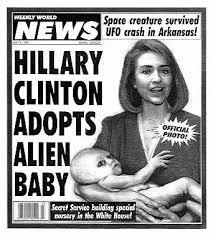 Can we let Hillary answer any "area 54" question 1st so as to set up the answer's CorrectThought ™, Please?....and Thank-You/Merci! Never happened. Nothing to see here, move along. Hope and Change Comes to Local Courts!